Made with triple infusion of freshly grated red clover to relieve pronounced and irritated scalp. 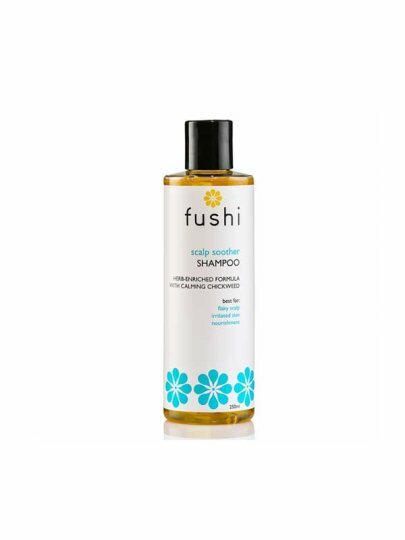 Provide a refreshing boost and gentle cleansing of hair. For the entire treatment, use the Herbal Conditioner for Sensitive hair. AquaW (water), Sodium coco-sulfate (from coconut oil), Cocamidopropyl betaine (from coconut oil), Glycerin (from vegetable oil - coconut oil), Capryl / capryl glucoside (from fruit sugars), Decyl glucoside (from corn oil) , Stellaria medium extractF (chickweed), Trifolium pratense flower extractF (red clover flower), Sapindus mukurossi fruit extractF (aritha), Lauryl glucoside (from fruit sugars), Aloe barbadensis leaf juice powderF (fushi mexican inner leaf aloe), Aleurites moluccana seed (Coconut Sugar), Coconut Sugar (Coconut Sugar), Calendula officinalis flower waterF (marigold), Boswellia serrata waterF (frankincense), Caprylic / capric triglyceride (fushi fractionated coconut oil), Glyceryl oleate (from coconut) Citrus bergam oil, Citric acid (food grade preservative from fruit), Levulinic acid (food grade from fruit), Sodium levulinate (from corn), Sodium benzoate (food grade preservative from coconut oil), Pelargonium graveolens leaf oil (jasmine oilflower oilE), jasmine grandiflorum flower oil (field of Indian jasmine oil), Rosa damascena flower oilE (fushi rose otto oil) ), Sodium phytate (from wheat bran), Hippophae rhamnoides fruit oil (Sea buckthorn), Citronellol, Geraniol, Linalol, D-Limonene, Benzyl Benzoate. Massage in the scalp throughout the entire length of hair. Rinse and repeat.